As corporations and even small businesses respond to the challenge of stricter regulations and complexity in government and legal compliance, the legal function gains ground on taking on a role of maximum importance for businesses across all industries. You may also see plan samples. In particular, legal operations demand the capability to impact an organization from the ground up in order to improve efficiency and profitability and in the advent of a dynamic business environment, this side of the legal profession aims to increase the effectiveness of internal legal teams’ functions and operations. With all the attention focused on the legal profession andow they would be able to improve the legal side of business operations, this might be a good time to put some thought regarding their role in your company. The responsibilities of the legal operations team could vary depending on the company or organization and the codes they have to comply with, which could also vary from sate to state. 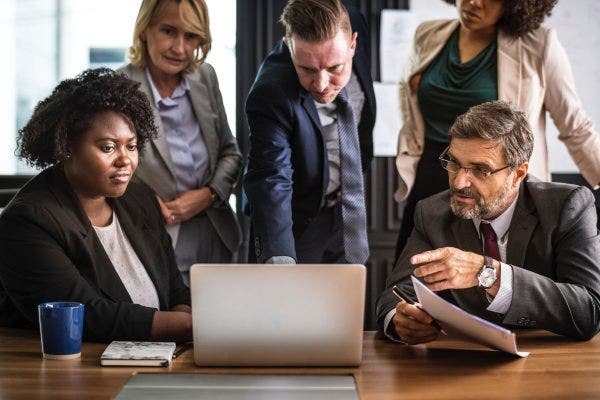 However, in some companies, legal operations set the course of management when it comes to external counsel and vendors, take charge of budgeting and staffing processes and offer leadership, especially to pro bono programs. Successful legal ops teams were responsible for helping the implementation of technology management systems and drive governance of important data and record-keeping practices thereby ensuring company compliance. You may also see strategic plan for your business. 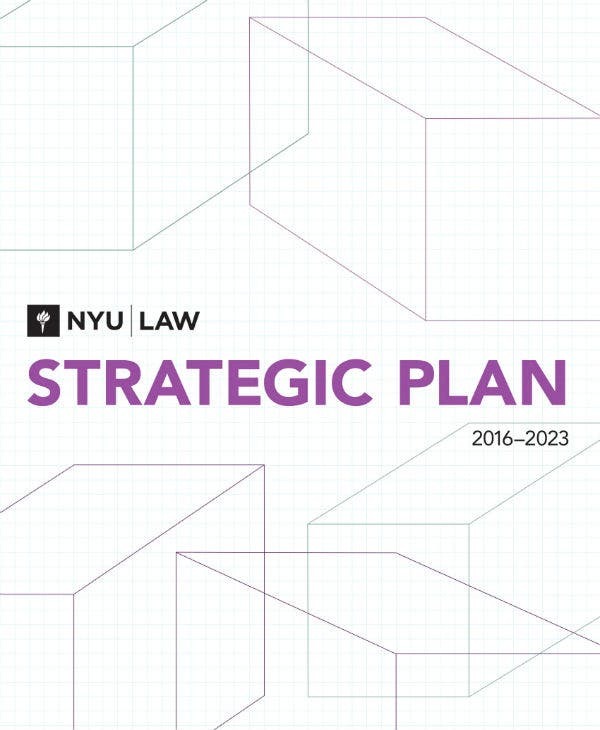 What Is a Legal Strategic Plan? 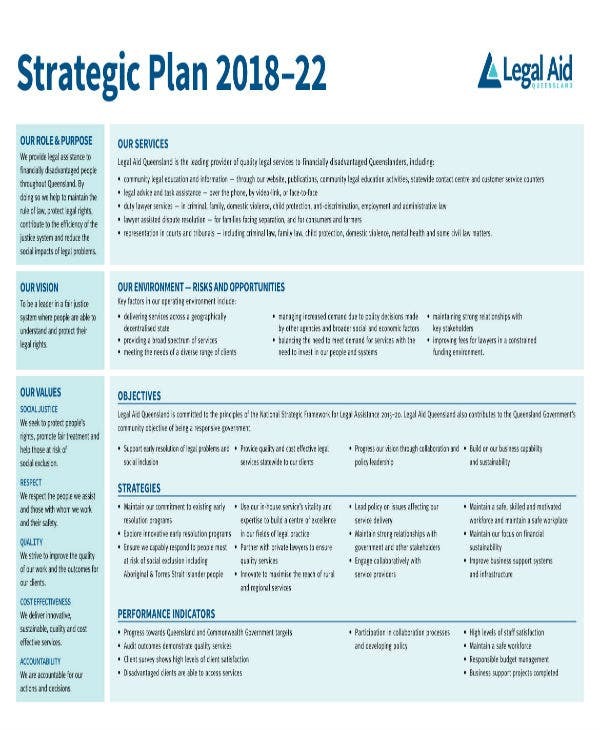 Legal department strategic plans are the governing framework to which legal, managerial, financial and organizational decision-making for in-house or internal legal operations are guided. No matter how organized, talented and even when they’re in a class of their own, even the best legal departments still face different and sometimes complex challenges when leading a performing in-house legal office. As today’s legal industry becomes more complex, they also tend to become more stringent, demanding goals to be more dynamic on top of dealing with external pressure and the internal organization’s need to reduce and manage costs. Before starting the strategic planning process, you should consider that different clients will have different needs and each of their needs are still subject to change. Therefore, their needs and your tasks will vary in many ways. For example, if a business needs to downsize or is currently experiencing organizational changes, and another company is preparing to expand, these changes will drive the planning of the legal department and put focus on the organization’s priorities. 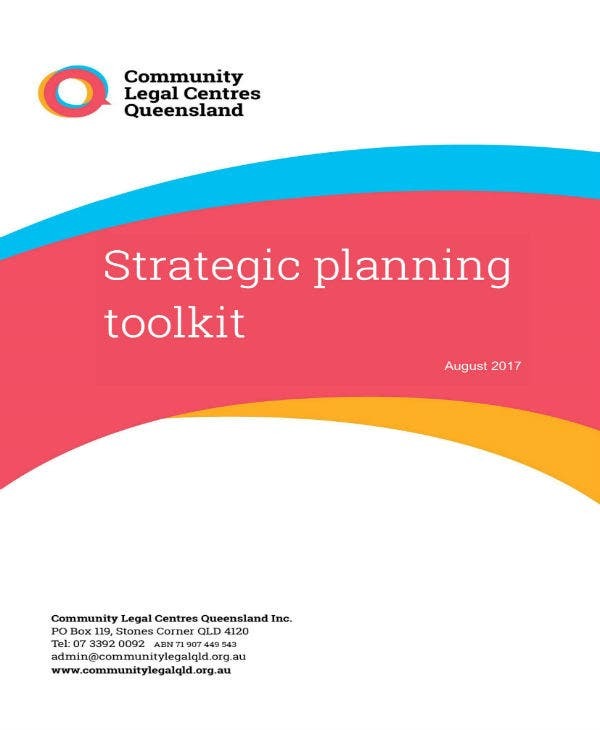 The strategic plan should also take into account other aspects of the department including its history, status or structure, what the department currently is versus what it should be and how this can influence the department’s capability in delivering their services or what the client expects. Development of the strategic plan should then taken as an opportunity in becoming proactive as well as managing the clients’ expectations in performance. 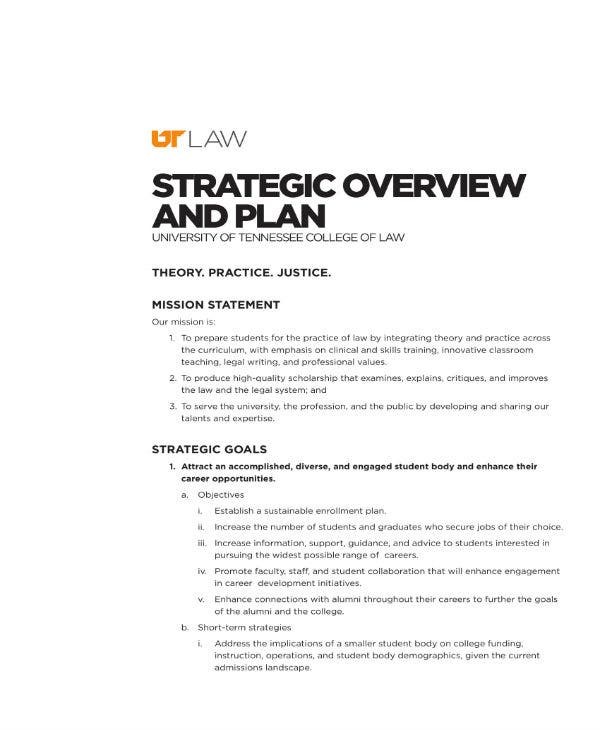 You may also see IT strategy plan templates. 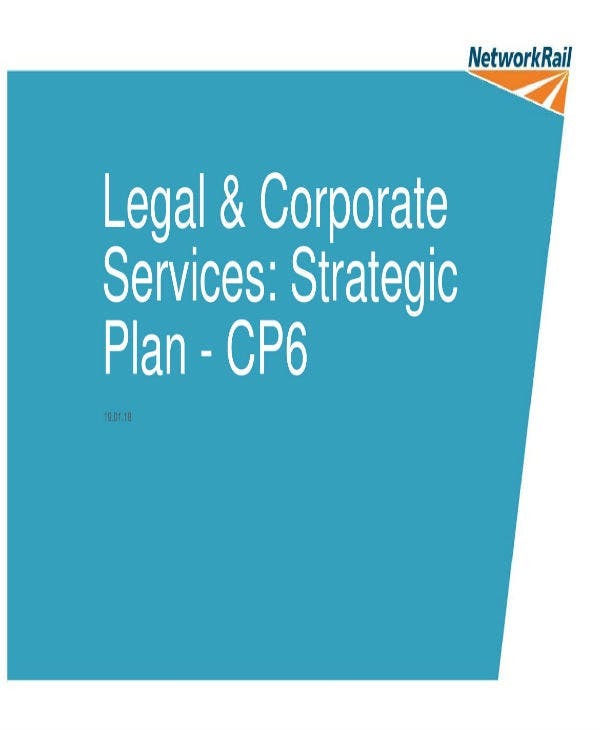 Different legal offices or departments may have varying ways to which they deal with their strategic planning process but traditional planning still offers a progressive analysis branching out from the development of clear mission and core values, addresses issues relevant to the implementation of strategies which then moves on to the development of better goals and objectives and ultimately to the creation and establishing of a robust action plan. While the process does not require to be complicated for it to be effective, it does demand effort and hard work which doesn’t have a shortcut. Furthermore, one should have a clear understanding of the end goal and what needs to be achieved, and how much. While the methods of proper planning may again vary between organizations, shareholders and business partners are generally one step ahead of strategic planners, which is something you should be able to use as a leverage. 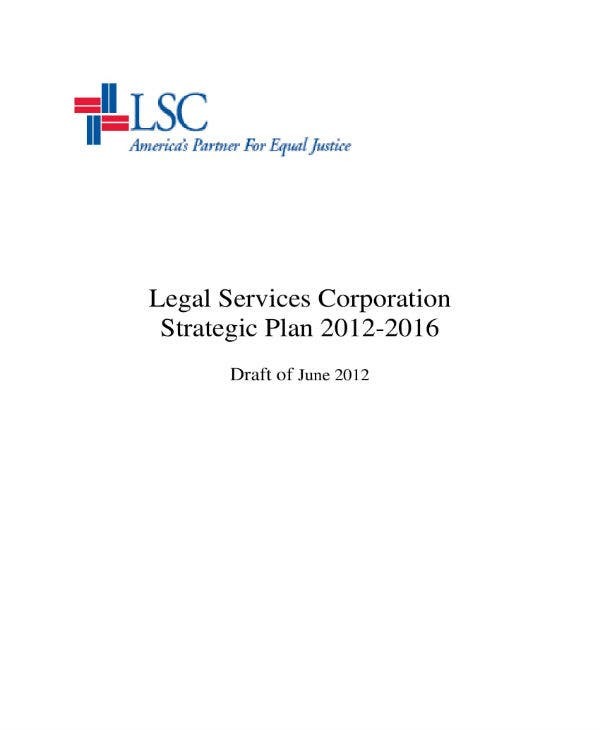 Incorporating the planning process with business goals facilitates the development of the strategic plan for the legal team. You may also see college strategic plans. Incorporating the planning process with the goals of the company helps direct the course of action when it comes to meeting a business’ legal requirements. 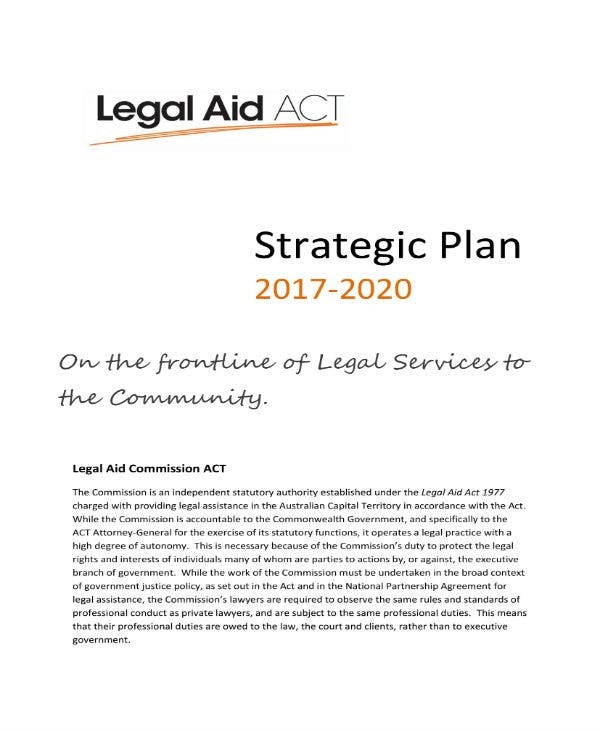 This doesn’t mean that the legal department’s strategic planning should just be limited to being reactive. You should still be involved in the corporate planning process. For example, if a company decides on extending its products to a certain foreign market, that move would likely be subject to a certain regulation which would make it hard for outside investment to be possible. Such cases should be tackled on the actual planning processes not when the planning has already been done. 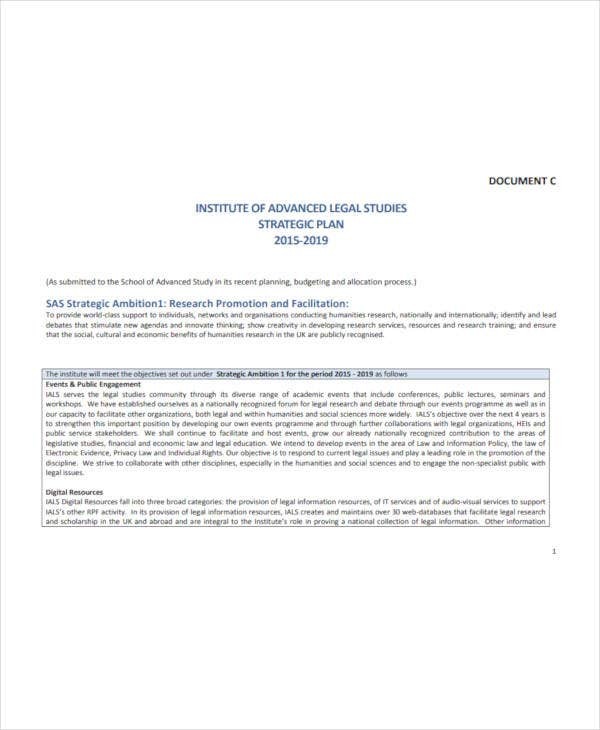 To facilitate communication across the organization, the legal department’s plan should also be created in the same style and format as the company plan. 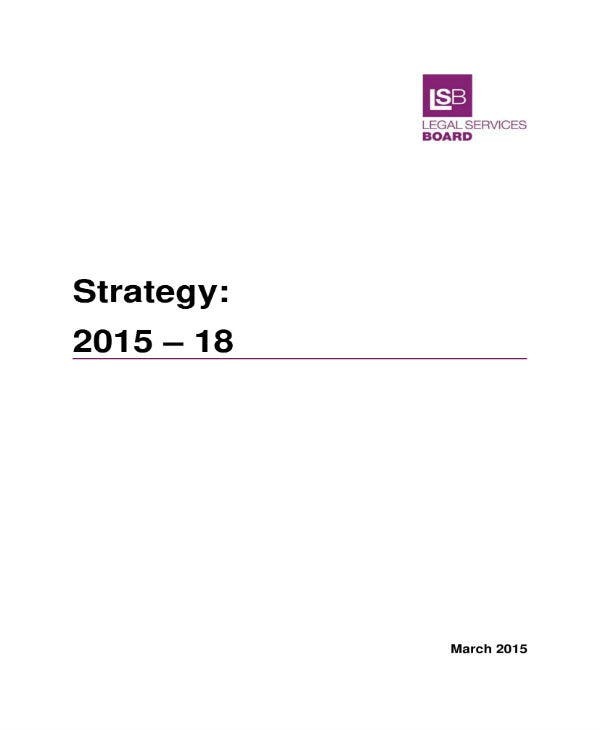 You may also see research strategic plans. Understanding the nature of a client’s business is something that can never be emphasized enough because it is at the core of your operations. Not understanding how the client do business and how they work will render you incapable as a business part. In fact, not understanding the client’s business will not make you a real business partner and this applies from beginning to the end of your relationship, which includes how they gain profit, the business climate in which it operates as well as the legal challenges. For example, if the client is involved in a certain transaction that through figures is profitable for the company but is on tight ropes individually. The planning will have to include providing legal services fit for that nature and you can only do this right by understanding the business. Otherwise, you won’t be able to deliver. 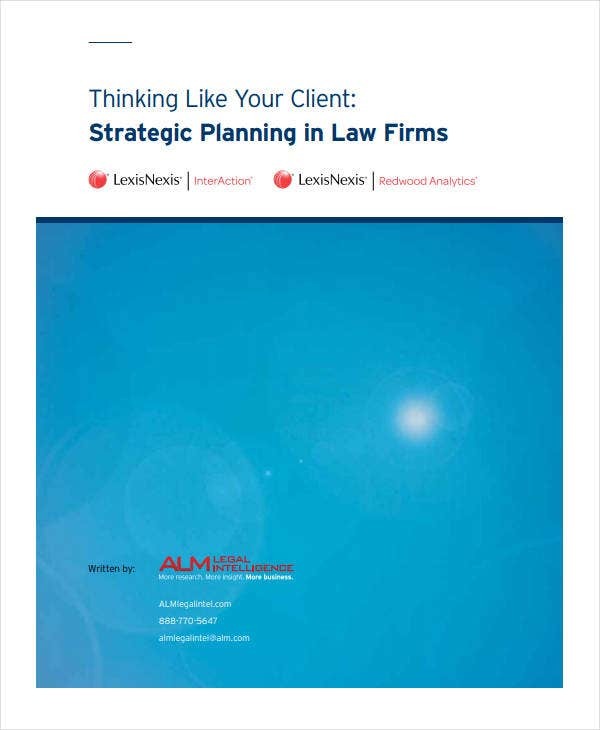 When it comes to budget planning, lawyers are known to have a bad reputation, arguing that there’s no way to control or the legal costs, especially litigation. These days though, you’d find that most lawyers reject this proposition. You simply cannot perform good strategic planning without good budget planning. Part of this also requires the legal department to understand how legal dollars are spent and evaluating where or what you spend them on. For example, you may have observed other people in the legal profession hat aren’t lawyers (yet) such as paralegals or those who have had training in law may handle the kind of work done by a lawyer and charge cheaper and still perform more effectively. Lawyers may not like this idea and adhere to the rules but it isn’t impossible. You may also see HR strategic plans. One cannot underestimate the importance of the security and application of the right metrics. Data can be acquired in many forms from numbers crunched outside of your counsel, figures tracing to the clients’ transactions which they provide, estimated hours of completing projects, timelines, deadlines, client surveys, internal and external legal spending as well as the number and types of lawsuits filed. It is therefore important to build metrics that would address the collection of data and then use it as part of the planning process. You may also see nursing strategic plans. Legal department or not, strategic planning can’t just appear and conducted out of thin air. Every company has its own, existing culture and even the absence thereof, should be taken into account. For example, if the company is known to marginalize and generalize lawyers as hindrances, the team should be able consider this fact in the strategic planning process. You may also see two page strategic plans. If planning has this kind of goal, then planning in this case may also exist to change the culture since it affects the ability of the legal department to deliver well and perform according to what’s demanded of them. In turn, if the company’s culture revolves around business units working to trump each other and the company has goals that complements status quo, this should also be considered in providing legal services, among others. You may also see strategic sales plans. By tradition, a strategic planning process follows a certain analysis, but you should be wary of receiving details that are too complex. Do not sit mulling over whether a data should be taken as a goal or an objective or whether or not your mission statement or core values is a perfect-fit for the kind of services you are able to provide. Don’t go searching endlessly for data that may not even exist. Get right to your planning and try to work around your first time through the whole process because the first time, if this is your first, won’t be perfect. You can always start developing and collecting the data that you’re sure you need. You may also see church strategic plans. It is safe to say that for the past decade to this day, legal operations are scoping out the best methods in delivering the best legal services for the organizations they serve and the organization’s stakeholders. You may also see business strategic plans.